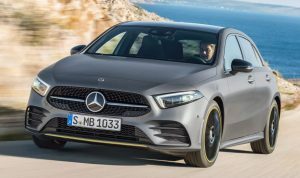 Intended to be Mercedes’ newest value added model sliding neatly beneath the CLA class, the A-Class sedan has some DNA looks wise from upper crust CLS, there are LED headlight, a Panoramic sunroof and the big three star grille. Nothing revolutionary on the outside from the press pictures. Inside, the A-Class look exudes luxury and convenience. The A-Class adds features as standard such as: push-button start, dual 7.0-inch displays, Apple CarPlay and Android Auto support. The new Mercedes-Benz A-Class made a dramatic Canadian debut at Toronto’s REBEL nightclub on November 14. A unique launch event took guests on an exhilarating journey that recreated a day spent behind the wheel of an A-Class, and was inspired by the cutting-edge infotainment system that is making its debut in the model: Mercedes-Benz User Experience (MBUX). The theme for the event was “Hey Mercedes, Set the Mood” – a nod to the A-Class’s highly customizable features and ability to help the driver make the most of every moment of the day. Over the course of the evening, more than 2,000 guests experienced four distinct moods – Up & at It, City Hustle, Escape the City, and Night Drive – each of which delivered a fully immersive sensory experience complete with sights, sounds, and a menu that was carefully crafted to match the ambiance. A five metre tall 3D screen displayed oversized dynamic visuals, surrounding party-goers with images that helped to create the right ambiance to suit each mood. The screen disappeared mid-way through the festivities in a dramatic Kabuki drop, revealing the new Mercedes-Benz A-Class. Options packages will be extensive and expensive and include larger wheels, bigger infotainment screen, navigation packages, a driver assistance package, a premium Burmester sound system, heated and ventilated seats, and a head-up display. The new A-Class offers beautiful design, a luxurious and spacious interior, and a completely new, cutting-edge infotainment system. The exciting entry in the compact class is the first to feature MBUX, a multimedia system that is ushering in a new era in connectivity. MBUX is customizable and adapts to suit the user, with an ability to learn thanks to artificial intelligence. The A-Class is a vehicle that will welcome a new generation of Canadian drivers to the Mercedes-Benz family. Pricing starts at $35,990 for the A 250 Hatch and $37,990 for the A 250 4MATIC Hatch, and includes impressive standard features such as a panoramic sunroof, LED High Performance Headlamps, Mercedes-Benz User Experience (MBUX), Mercedes me connect (Mmc), and DYNAMIC SELECT.